Don’t forget about tomatillos and ground cherries! For most areas of the Pacific Northwest, the last frost date is past and the forecast is sunny, so this weekend should be a great time to set out tomatoes and the hardier warm-season vegetables. While most gardeners consider a tomato plant (or thirty) an absolutely necessary ingredient of the summer vegetable garden, two of the tomato’s tasty relatives are often overlooked. Tomatillos and ground cherries are husk vegetables that share some characteristics with tomatoes, but each have their own delicious place in the gardener’s kitchen. Often mistaken for each other, both tomatillos and ground cherries produce small round fruits encased in papery green husks. Tomatillo (Physalis ixocarpa) is probably more familiar to most American palates, as it is the central ingredient in Mexican-style green salsas or green hot sauces. Tomatillos are typically 1 to 2 inches in diameter, ripening from green to yellow-green to pale yellow. They are very tart with a firm texture and are usually eaten cooked in chili rellenos, salsa verde, guacamole, or other Mexican and Southwestern dishes. Ground cherries (Physalis pruinosa) are slightly smaller, with a sweeter, fruitier flavor, and can be eaten fresh, dried, or used in desserts, sauces, preserves, pies, and salads. In the garden, tomatillos and ground cherries are grown much like tomatoes. Tomatillo plants may reach 3-4 feet tall and can be caged or staked as you would tomatoes. Ground cherries are a little shorter, around 18 inches tall, and can be allowed to sprawl 2 or 3 feet wide. As noted above, fruits are ripe when they have filled their husks, which start to dry out and split open. When fully ripe, they’ll drop from the plant. These can still be collected and eaten if they’re found before they lay there too long and start to rot. One important note: a lone tomatillo may grow and bloom but set little fruit; for abundant harvests, grow two or more tomatillos near each other to encourage cross-pollination. Drying Ground Cherries – This makes an excellent, chewy, sweet-tart winter snack (similar to raisins)! Remove the husks, then halve each fruit and place on a drying rack (or in a very low oven) until dry but not brittle. Store in an airtight container for up to 3 months (or longer in the freezer). Freezing Tomatillos – In fall (October to early November depending on the weather), go gather the bucketfuls of fruits that have ripened and fallen off the plants (but haven’t started to rot yet) and pick any off the plant that feel as though they have mostly filled out their husk. Remove the husks, then bring a large pot of water to a boil. Boil in batches, tossing in enough tomatillos to equal about 1/4 to 1/3 of the water volume, and leaving them until they rise to the top, about 3-5 minutes. Then puree in batches in a food processor, let the puree cool a bit, and package in Ziploc bags (squeeze out the extra air) or small plastic containers and freeze. All winter you can pull out these packets and use the puree as you would tomato sauce or to make fresh salsa or green sauce. 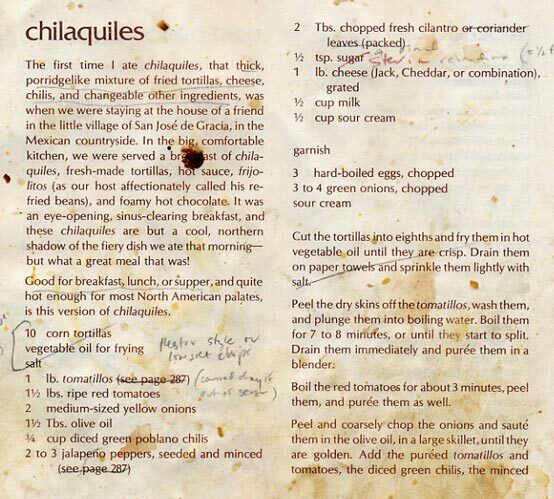 Our favorite recipe for tomatillo puree is Chilaquiles from the Vegetarian Epicure. 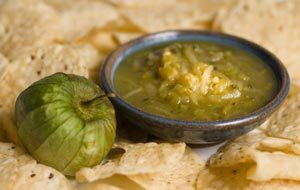 There’s also a mouthwatering description of Jewel Colored Tomatillo Salsa with a recipe at the Tazita de chocolate Mexicano blogspot.